The captivating story of Nora and Kettle continues in Hiro Loves Kite, the second installment in the award-winning Paper Stars historical fiction series by Lauren Nicole Taylor. Nora finally has her beloved sister Frankie back, but that's just the beginning of their struggles. She must now become Kite--a stronger, more independent version of herself--a king and a guardian. 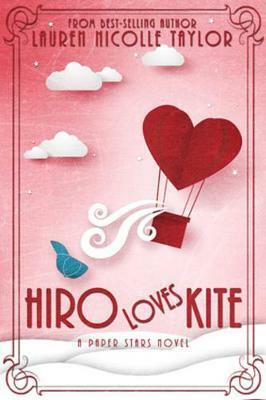 Hiro loves Kite--but Kite won't wait forever for him to tell her. And now they're standing on icy ground. The leverage they had on Kite's abusive father has wavered, and life on the street is affecting Frankie's health. Snow is gathering at the station doors, and doubts are piling high...they must rely on each other, and believe in the magic that got them this far. If they don't, it's not just their future in jeopardy--but the fates of all the street kids in their care--all the Kings. Fans of Nora and Kettle have asked for more of their story since it first hit shelves. By popular demand, Lauren Nicolle Taylor has written this follow-up that is sure to please her fans. Find out why readers are calling this series "unforgettable," "powerful," and a "remarkable reimagining of Peter Pan."